Explore historic Yukon and relive the gold rush days while taking in the beauty of America’s wildest frontier – Alaska. Experience the best the region has to offer as you explore spectacular wonders like the Icefields Parkway and the world’s largest dark sky preserve. From iconic western-style towns like Dawson City and Skagway to the scintillating wonder of an Alaskan cruise, there is stunning scenery and riveting history in equal measure as you continue your exploration from the Wild West to the even wilder north. Your journey begins with a two night Special Stay in a view room at the Fairmont Banff Springs, popularly known as the ‘Castle in the Rockies’. Tonight, celebrate with a welcome dinner. Today, be as relaxed or as active as you wish. Head to stunning Lake Louise where you’ll check into your luxurious lakeview room for a two night Special Stay at Fairmont Chateau Lake Louise. Fine or casual dining – the choice is yours. Enjoy a leisurely start to the day around the shores of breathtaking Lake Louise. Meet a retired member of the Mounties for an insight into their role in Canada’s past as well as present. Today, an ‘Ice Explorer’ will transport you to Athabasca Glacier. Fairmont’s Jasper Park Lodge, your home for the next two nights, sits on the banks of Lac Beauvert. Make the most of this extraordinary place with your choice of activity. Board the famous Rocky Mountaineer and enjoy full dome window views as the majestic Mount Robson towers above you. Tonight, stay at a Kamloops hotel as assigned by Rocky Mountaineer. Relax in the luxury of Rocky Mountaineer’s GoldLeaf Service as you continue your journey to Vancouver. Two night stay at historic Fairmont Hotel Vancouver. Venture into the luscious rainforest on the edge of the city at Capilano Suspension Bridge Park where Scenic guests will have the park exclusively to themselves. Later, get to know Vancouver during a city sightseeing tour. Today, board your luxurious cruise ship. Check into your Verandah Stateroom on the Holland America ms Westerdam or ms Noordam. Today, see Alaska’s first city, known as the ‘salmon capital of the world’. Explore Alaska’s tiny state capital, only accessible by air or sea. Wander through historic Skagway where echoes of the gold rush era can still be heard. Enter the iceberg-strewn waters of Glacier Bay National Park. A National Park Ranger will help you spot wildlife, while explaining glacial activity. Enjoy the luxury amenities and wide array of activities on the final day of your Alaskan cruise. Disembark in Seward and take a scenic rail journey past magnificent glaciers, canyons and waterfalls. Check into Hotel Captain Cook after a short orientation tour. Upon arrival in Anchorage enjoy a city tour. Travel north to Denali State Park, stopping in at the quirky town of Talkeetna en route. Enjoy a Special Stay at the lovely Mt. McKinley Princess Wilderness Lodge. Relax on board the full-dome McKinley Explorer as you travel through spectacular landscapes to Denali National Park. Enjoy a two night Special Stay at the McKinley Chalet Resort and enjoy the Music of Denali Dinner Show. Today, explore the rugged Alaskan wilderness through a range of handcrafted activities. Visit Husky Homestead, home of four-time Iditarod champion Jeff King. Enjoy a warm welcome and gain insight into rural Alaskan lifestyle while getting to know a champion Iditarod team. Check into the Westmark Fairbanks Hotel for a two night stay. Learn of Alaska’s gold mining history. View the Trans-Alaska Pipeline, then board a replica of the Tanana Valley Railroad to Gold Dredge 8. This afternoon, board an authentic sternwheeler for a cruise along one of Alaska’s great rivers. Fly to Dawson City, once the heart of the Klondike Gold Rush. Two night stay at the Westmark Inn Dawson. Choose how you wish to spend your day in Dawson City. 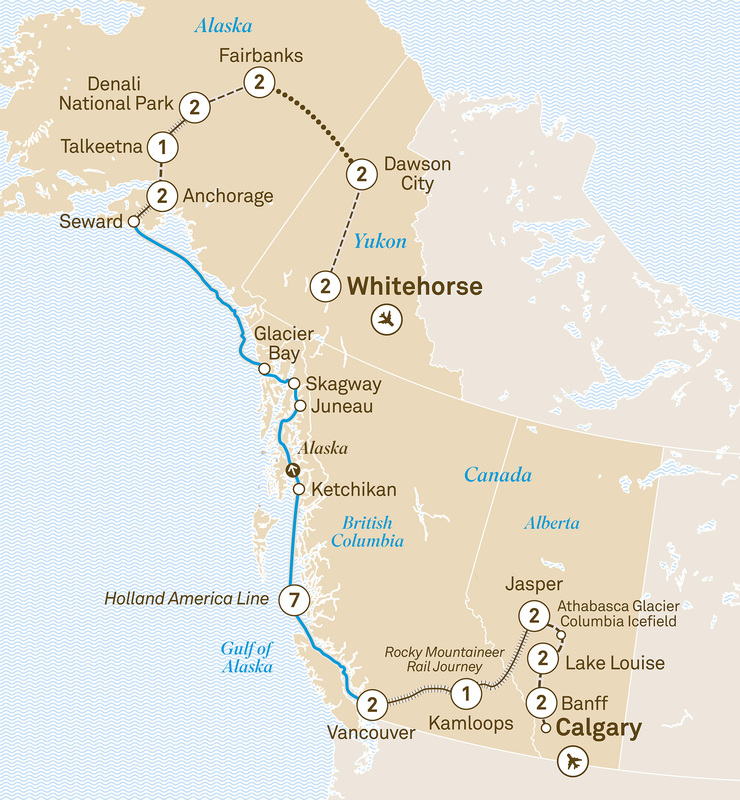 Travel via the Klondike Highway to Whitehorse for a two night stay at the Raven Inn or similar. Visit the Yukon Wildlife Preserve to see wildlife in their natural habitat, including moose, caribou, lynx and bison. Afternoon is at leisure. Enjoy a farewell dinner as your journey draws to a close.